Looking for a way to add beauty, functionality, and strength to your interior? Count on our flooring store for stunning, durable, and reliable vinyl flooring that improves the appeal and value of your home or business. Helping you select the right floor from our expansive inventory of vinyl sheet, tile, and plank flooring, our experienced and friendly flooring specialists ensure you have all your needs covered. Rest assured that the quality of your new floor is never in question when you make a purchase at our showroom. Not only do we stock the most trustworthy brands in the industry; but we also provide our customers with an Ultimate Confidence Guarantee™ and a variety of warranties depending on the floor. Our showroom selection includes vinyl tile flooring, vinyl sheet flooring, and vinyl plank flooring. Best of all, we also provide you with great deals on this sensible flooring option. With our buying power, we have acquired a wide range of vinyl floors at lower prices; and we pass the savings on to you. Competitive pricing allows you to do more and acquire an interior that aligns with your sensibilities. Whether you are re-flooring one room or the entire home, our diverse selection of vinyl flooring has you covered. One of the most attractive features of vinyl is its versatility. Contemporary manufacturing methods allow vinyl to take on the look and texture of many other flooring types, such as tile, stone, and hardwood. On top of that, this flooring option incorporates a durable construction that makes it highly resistant against scuffs, scrapes, and stains. As such, it is an ideal option for high-traffic areas, like kitchens and bathrooms. Give your kitchen, bathroom, or other areas an easy-to-clean, durable, and fashionable new floor with our vinyl sheet flooring. Unlike older versions of vinyl sheeting, our vinyl floors look excellent with any décor. In addition, modifications to the manufacturing process in recent years have made this flooring option far more comfortable to stand on than before. With a variety of prints and patterns available, you can spruce up the look of any room quickly, easily, and affordably. Vinyl sheet flooring is highly adaptable to virtually any surface. It may be cut to match the contours of a room. In addition, a continuous roll of vinyl is easier to impart a seamless installation for virtually any room. Our sales representatives are on hand to find the materials that allow you to complete your project with ease. Have you wanted to upgrade your home with the look of tile but have not been comfortable paying the price of typical tile? Fortunately, we have an alternative means to achieve the desired results. 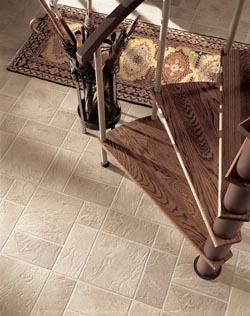 Our vinyl tile products accurately mimics the look of stylish tile without the upkeep needed to maintain the grout. Vinyl is an impressive flooring option for savvy homeowners. It comes in so many different varieties that cater to your personality and budget. From majestic wood to elegant slate, vinyl tile flooring enables you to customize your space on your terms. Tiles may be cut and shaped to the dimensions you need, resulting in flexible remodeling projects and stunning results. The modular nature of tile flooring also allows you to create your own unique patterns and designs. From traditional patterns to contemporary flair, your options are virtually limitless when you choose vinyl tile flooring. Unlike other flooring stores, we have a staff of professionally trained technicians to provide vinyl flooring installation. This means you never have to worry about inexperienced people treading on your floors and making a mess of a renovation project that should improve your property. Take advantage of our skills by scheduling our installation services after you find the right tile to match your home décor. Because our flooring store is locally owned, you can expect friendly customer service from our team. We work with you to find the interior design and remodeling options that suit your specific goals. From our flooring experts in the showroom to our vinyl flooring installation services, we have the skills to match you with the right vinyl plank, tile, or sheet flooring for your home. Contact us us today to learn more about our vinyl products. We’re proud to serve customers in Torrance, Palos Verdes, Rolling Hills, Lomita, and Rancho Palos Verdes, California.